Concepts of empowerment are frequently advocated as a positive and proactive approach to health promotion and education. Despite (or perhaps because of) its popularity, the concept of empowerment remains under-theorized. This IS Academie Education and International Development public lecture is geared to unpacking the notion of empowerment and examine how a more nuanced understanding can support efforts to improve young people’s health and rights. Esther Gaarlandt (NCDO), has written a report on the evening (in Dutch), published at One World/Love. Please follow this link for the full report. As a registered nurse, Grace has worked in a number of international settings including the UK, Tanzania, South Africa, Brazil and Australia. Her research interests include examining young people’s perspectives on health and health-related risks with specific reference to empowerment theory in health promotion. Drawing on data from a close-focused enquiry with young people in England, Grace Spencer will discuss some of the theoretical contradictions and operational complexities for understanding empowerment as it relates to young people, their health and rights education more broadly. Miranda’s work evolves around designing, conducting, documenting and presenting qualitative participatory research relating to children, adolescents and young people’s sexuality, particularly in low income countries in Africa and Asia. Central to her work is an applied medical anthropological approach and the active participation of children and young people in various levels and stages of research, intervention development, implementation and M&E. 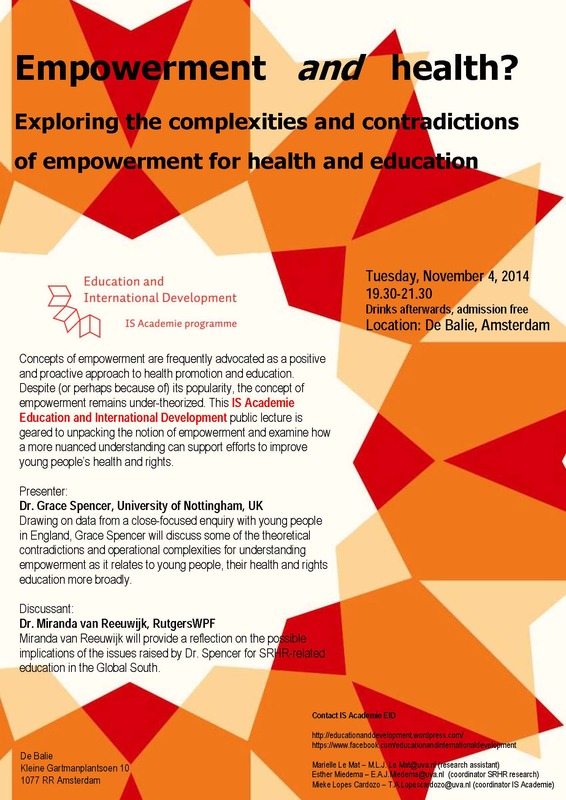 Miranda van Reeuwijk will provide a reflection on the possible implications of the issues raised by Dr. Spencer for SRHR-related education in the Global South.